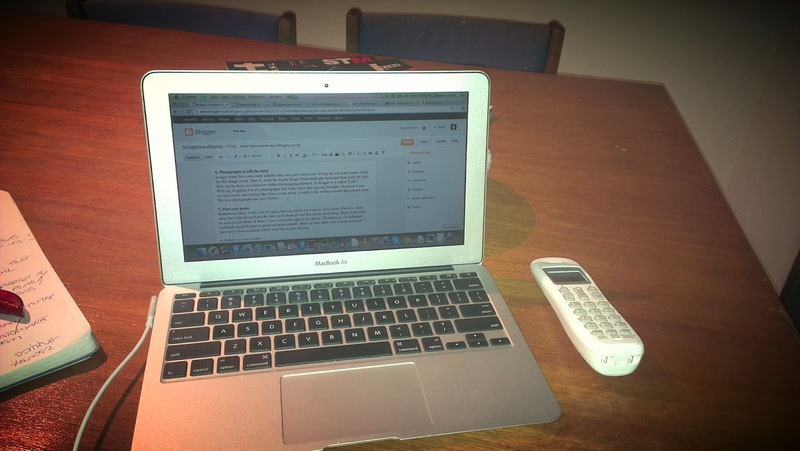 So you think you might want to start a blog, become a blogger, enter the blogosphere? You have a yearning to put your words out there for the world to see. Why not, I say go for it! You will learn so much, about yourself, human behaviour and the world. The best bit however is that you will connect with like-minded people. People that get you. If however they do not get what you are trying to say they can offer you a whole different perspective. This is the path to an open mind, to learning about each other and realising you are normal. I have only been blogging properly since October 2013. So 3.5 months. The reason why I blog can be read here. I stumbled upon this addictive world before I really even knew what a blog was. As a result it has been a big learning curve. I am by no means an expert but I thought perhaps I could share what I have learned so far. 1. 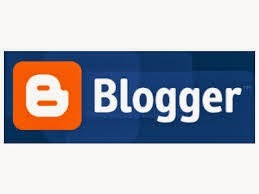 Which Platform: You need to decide which blogging platform to choose. I only really know of WordPress and Blogger. WordPress is thought to be the superior of the two. As with most things they both have pros and cons. I like how with WordPress you can buy your domain. Which means your address can be snippetsandspirits.com rather than snippetsandspirits@wordpress.com. I cannot really talk much more on WordPress it seems to have a more superior commenting system and good tech support, I believe however it is not the most user friendly platform? I use “Blogger”. Blogger is really quite user friendly. If you have a google account already you can just open a “Blogger” account off that. If you attach your blogger account to “Google + ” you then have that profile to share your posts on. I will discuss the downside to Goggle + further on. I have to say it did take me a little while to get used to Blogger but I am fairly happy with it and I think the Google + profile is of benefit in driving some traffic to your posts. The only downside is, if I want to buy my “domain”, I have to buy it from another Domain register. 2. Next you must decide on a Blog Name? This can be a hard one. Quite often the many names you think of may already be taken. I like my name although it is a little obscure and does not really tell you what the blog is about. There are many posts written about picking your blog name. You can use your own name which is easy. If not something short, that stands out while also considering who your target readers are going to be. 3. Should I blog under my real name? All the successful bloggers use their real name. Anyone not using their real name will eventually have their cover blown. Many of you know the name I blog under is slightly different to my real name, privacy being my main concern. When I started to Blog I just wanted to be Snippet Spirit. Google + does not allow for this, you have to use a real name. If you eventually want to start a Facebook page you have to do this through your personal Facebook account which means any other bloggers you follow will be done using your personal name. So in this social media day and age. My advice is use your real name because the truth will eventually be revealed. Which brings me onto the next point of privacy. Be vague about where exactly you live. Consider whether you want to use your family’s real names especially children. Consider your children’s future when their whole lives may be on your blog. When they enter into the workforce and a potential future boss Googles them for background checks, to find when they cut their first tooth and learned how to use the potty. Always check photographs do not lead undesirables directly to your house. Look at backgrounds and landmarks before posting. Watermark your photographs. Which simply means putting text on them making them less desirable to steal online. I simply do this on Picassa or you can use a great site called PicMonkey. Images make for a nice story whether they are your own or not. If they are not your’s insert a link for the image credit. That is, write the words “Image Credit” highlight them and then insert the “link”. This can be done on a function within the blogging platform. In blogger it is called “Link”. With my blogging it is my photographs that I take daily that spur my thoughts. However if you are into words and writing like I have come to be, it really is the written content that matters most. The nice photographs are just a bonus. 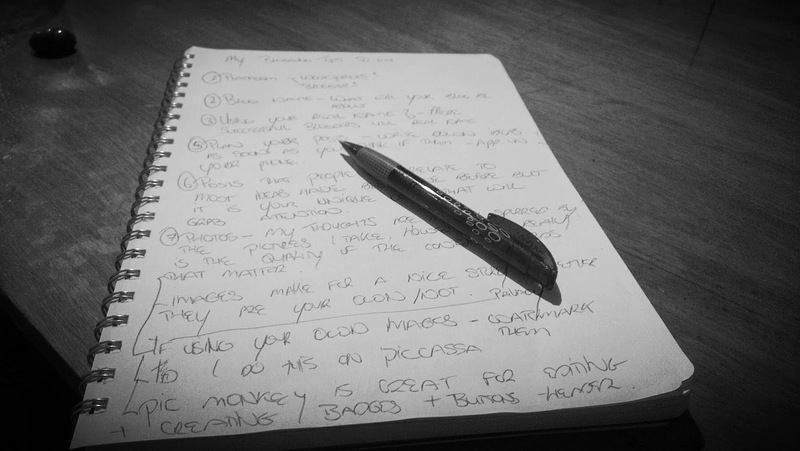 Brainstorm ideas, write a list of topics that you know you want to write about. I have so many ideas but I just do not have the time to post them all and that can be frustrating. Write down ideas as soon as you think of them. I use a memories app on my phone. Of course an old fashioned notebook would be just as good and more reliable. Back up your posts onto a word document. I have had a few occasions where mine have gone missing. Throughout my short time blogging I have come to slowly grasp what it is readers want from a blog post. They want to know all about you. They want to be able to relate to you, they want to feel they are normal in the way they think and act. The want to be inspired. Your ideas may have been done a million times before but it is your own unique voice that will tell a different story. Always end your post with a question to your reader. 9. Find a theme and/or logo for your Blog. This has taken me a while to catch onto. But you want a theme that people are going to recognise as being you. Like for instance my “header” which I also use on my Facebook page and my Twitter Page. Make Blog buttons, that is, tiny pictures of your blog that you can press on and they will bring you straight to your Home Page. Rhianna from A Parenting life has done a brilliant post on how to make buttons. I always appreciate seeing a picture of the blogger who’s words I have fallen for. Consider this. Again it took me a while to build up the courage to do this but I would highly recommend it. People want to know who they are talking to when they take the time to leave a comment on your blog. If you do this then nobody can say that you are wrong, they might just offer you a different perspective. So you have started your blog and hit publish what now? People need to find you. You have put your words out there for all to see. You were so nervous pressing that publish button but fell flat when after two days there has been no visits. You can continue like this putting your words out there but it will fast become a very lonely monologue. Blogging is about connecting, starting a conversation. So how do you connect? Consider allowing guest commenting. Make it easy for people to comment. Leave comment’s on lots of other blogs. Read lots of blogs. So many words of wisdom can be shared. Be gracious. If someone comments on your blog, go to their blog and return the love. This is so important. I Cannot stress getting into Linky Parties enough. This is where you will meet brilliant minds and read wonderful words. Basically a blogger hosts a linky. They write a post and then have a little app for you to add in a link to your post for that day. You then visit each other’s posts spreading the comment love. Sunshine Sundays with Zanni from My Little Sunshine House. In my experience get into Linky Parties first. Perfect your art, gain confidence and blogging friends. Then you will feel like branching out to find more readers. The majority of people that comment on your blog will be other bloggers, they are the ones that are brave enough to step out from behind the screen. However the readers will “like” and “share” and hopefully it will grow from there. Start a Facebook page for your Blog so that if you want to share your posts you are not annoying friends who are simply not interested. If they are intrigued then they can “like” your page and follow you to their hearts content. Whatever form of social media you get into it can be very time consuming. I never watch TV anymore but that is mostly a good thing ! E. Keep blogging to set days. Do not let it take over your life. Maybe only blog during the week keeping weekends free to live, otherwise you will have nothing to blog about. Finally enjoy the ride. It is a labour of love but you can become addicted. I love it and I think I am here to stay. A much more experienced writer and blogger than I will be sharing her tips on her blog please visit Zanni’s My Little Sunshine House. Zanni is a wonderful writer and I have no doubt will have some invaluable tips to offer. Some of the blogs I regularly read can be seen on my side bar under “Brilliant Bloggers” I do not have everyone there as I have not had the time to fix it properly. It is a work in progress. But please do check other bloggers out to get a sense of what it is all about. If you are struggling to find your blogging voice I would highly recommend taking on a 31 Day Challenge which means posting every day. This really pushes you to the limit and makes you dig deep. It will surprise you what will be revealed. If you are a blogger what major points have I missed? Linking with Essentially Jess for IBOT .